Google has recently announced a few updates to its Docs and Slides apps for Android and iOS. These updates are mainly concerned with the addition and customization of images in Slides and Docs. 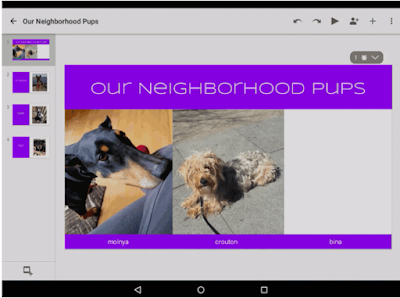 Users now can easily integrate pictures into presentations or documents right from their mobile device or tablet. They can either take a photo using the camera on their devices or use the pictures already saved in their camera roll. The updates released today are also available for offline access with no internet connection. To try out these new tricks, you will need to update your Docs and Slides app. Here are the links for Google Play and Apple Store (Docs, Slides) .